Bishop Noel Jones, of City of Refuge in Los Angeles, CA, closes out the second night of WORD EXPLOSION 2012. CD and DVD sets are avaliable for purchase at the GGC bookstore or online at www.GoldenGateCathedral.org. Order yours today! Join us each and every first Tuesday of each month for TERRIFIC TUESDAY 2.0! Terrific Tuesday begins promptly at 5:30PM with dinner for only $3. Then interactive bible study follows at 7PM. Terrific Tuesday 2.0 is held in the Family Life Center (FLC). So bring you iPad, iPhones, Kindles, and Android devices for this interactive bible study! Cutting Edge ministry. Out of the Box! What a time we had in Atlanta, GA for the 19th Annual Full Gospel Baptist Church Fellowship International Conference! This year’s conference was a little different than years past. This year it was a 6N1 Conference. What is a 6N1 conference you may ask. It was 6 major conferences going on at the same time! Senior Pastors conference was led by Bishop Joseph Walker, Women by Pastor Debra B. Morton, Worship by Overseer William Murphy III, Men by Bishop Herbert Andrew, Young Adults by Overseer Terrance Johnson and Children and Youth by Overseer Christopher Harris. Wow! 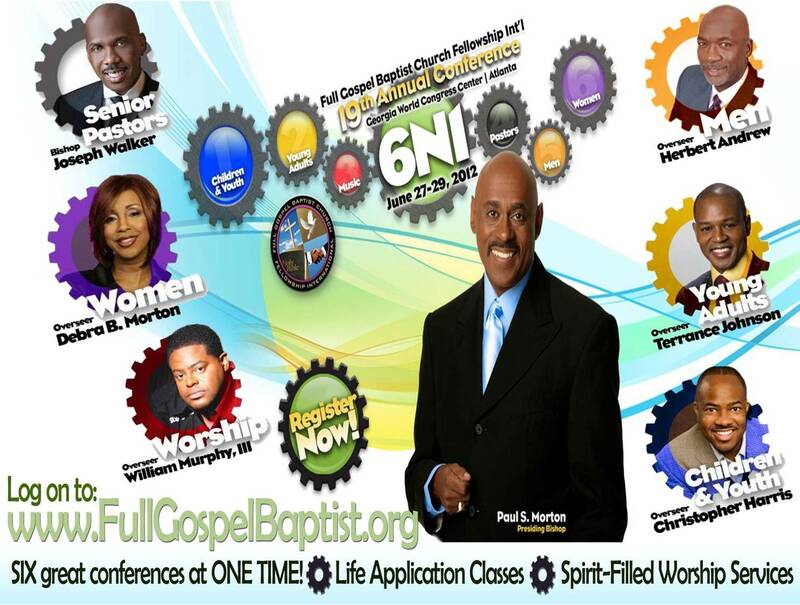 Major conferences led by dynamic men and women of God. The night general sessions were led by 3rd Presiding Bishop, Clarence E. McClendon, International Presiding Bishop, Paul S. Morton and Pastor Donald Parsons! We were challenged to have RIDICULOUS faith. It may sound ridiculous, seem ridiculous and even look ridiculous, but out of ridiculous faith, comes ridiculous blessings! The DVD of each night is avaliable for purchase through the Full Gospel website at www.FullGospelConference.org! Next year, our very own Bishop Edward H. Stephens and the entire Central region will be the host Bishop and region for the 20th International Annual Conference in Louisville, KY, July 3rd-5th. So save the date and come out and show the International Fellowship how the Central regions welcomes their guest and praise the Lord in 2013! We will be CELEBRATING LEGACY and PURSUING DESTINY! See you guys in 2013! Didnt make it to Word Explosion? Dont worry, we have DVD and CD box sets ready for purchase in the GGC bookstore. Rather you want to relive those life changing nights or share that blessing with a friend, neighbor or co-worker, we have just want you need. DVD sets are only $35 and CD sets are $25. Order you set today!